Southdown, ever primarily a Leyland operator (though Guy got a look in from time to time) also had a modest requirement for lighter chassis. 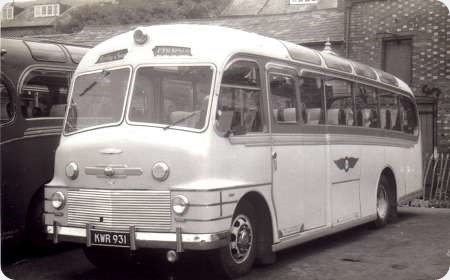 Despite having operated the OB model successfully, Southdown then eschewed the Bedford SB when it looked for a lightweight coach chassis in the late 1950s. It is understandable that the Bedford petrol engine did not appeal, and the alternative Perkins R6 was not a very attractive diesel option either. From 1960 Bedford offered the SB with a Leyland engine, but even this did not entice the Southdown company. Instead, whilst still favouring Leyland’s lightweight Tiger Cub, hitherto highly conservative Southdown became surprisingly interested in the unconventional Tilling Stevens TS3 opposed piston, three cylinder, horizontal two stroke engine, and bought 25 Beadle Rochester C41F coaches in 1956-57. 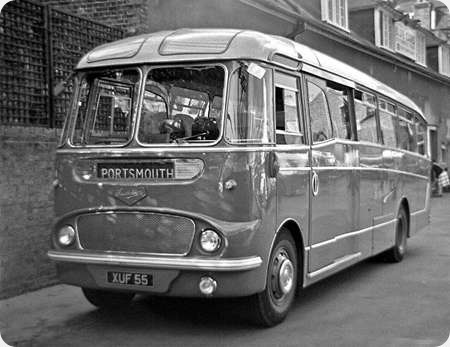 In 1959, after further Tiger Cub deliveries, Southdown returned to the TS3 engine with a batch of 15 Commer Avengers with Burlingham C35F bodies, their first from this coachbuilder since the 1930s. Another batch of 15 Avengers followed in 1959-60, but these were given Harrington Crusader Mk1 C35F bodies. The Beadles and the Commers all gave up to 12 years service with Southdown, the last being sold off in 1971. I recall seeing – and hearing – the Avengers quite regularly on the Brighton service along the A23. Their distinctive sound was unmistakeable. Seen here tucked away in a corner of Victoria Coach Station in 1960 is the last of the Harrington batch, No.55, XUF 55. I hope the panelling and upholstery had sound deadening qualities of the highest order. Detroit diesels of the period had a reputation for noise but the TS3 was in a league of its own! A further batch followed 41-55 shown in Roger’s picture. There were 15, numbered 56-70 (56-70 AUF) and were also bodied by Harrington. I assume that they were identical to the earlier batch, but my memory of seeing them can no longer recall any detailed differences, if any. I have just looked through the 2-volume history of Southdown by Colin Morris (Venture 1994), and the Vol.2 fleet list only prints the Beadle-Commers 1-25, and has neither list or photo of the Commer Avengers 26-70! Perhaps he had been deafened by the first 25? It may be the angle of the photograph but this vehicle has a rather narrow look about it. Were these coaches 7ft 6ins. or 8ft. wide? Commers raise a question in my mind: are they really a lightweight in the same sense as a Bedford or a Ford is? We often call the Leyland Tiger Cub a lightweight, but I’d prefer a term like "three-quarterweight" or "quality lightweight", since the feel of a Tiger Cub is solid and precise, like that of a heavyweight. In the same way a Guy LUF is every bit as solid as the over-heavy UF. On that basis perhaps the Commer is a "five-eighths-weight". Interested to hear fellow OBP-ers’ views. I don’t recall seeing any of these at all – were they based in Portsmouth? That’s a fine image of the two examples from each batch standing together. The only difference I can see is that the XUF driver’s mirrors are attached at the top of the windscreen, whereas the AUF mirrors are attached at the bottom. (And of course the windscreen wipers are facing in opposite directions…). My 1970 fleet list (SEC) shows the Portsmouth allocation as 6 XUF + 3 AUF , Eastbourne 4 XUF + 3 AUF , Worthing 7 AUF, and Brighton 5 XUF + 2 AUF , so they were quite well spread along the coast. The earlier Burlingham bodied batch (26-40) were at Eastbourne (3), Brighton (6), and Chichester (6). This is likely to have been their final allocations as Roger Cox notes that they had all gone by 1971, and the list I’m quoting from is accurate to 1st November 1970. There is one more minor difference between them and that is that the XUF’s sported only a nearside spotlight; the AUF’s, one each side. Thanks, for the allocation details, Michael. You’d have thought that Southdown would have kept them all at one depot for ease of maintenance. Whilst I was looking for a photo of the other batch, I noticed photos of some of these vehicles working for contractors, showing that some had a further life beyond Southdown. I think all of Southdown Commer coaches and all of the Commer-powered Beadle coaches were eight foot wide. The reason that the Harrington-bodies look narrow is that they are tall compared to similar bodies on Thames or Bedford chassis. Thanks, Michael for reminding me that there was a further batch of the Harringtons. The straight framed Avenger was introduced in 1949, and the overall dimensions of the 109 bhp 4.75 litre six cylinder petrol engined Mk I were 27ft 6ins by 7ft 6ins. In 1952 the Mk II increased the available dimensions to 30 ft by 8ft, but the petrol engine was retained. Then, in 1954, the Mk III appeared offering the TS3 engine as an option, and this became the Mk IV from 1956 when the petrol and smaller chassis alternatives were dropped. The standard rear axle ratio was 4.3 to 1, but the Eaton two speed axle was also offered. Taking up Ian’s point about internal noise, the compact horizontal engine was installed over the front axle where the (no doubt well insulated) floor went over it, and this contributed to the apparent height of the vehicle. The engine was thus some way forward of the main saloon. Externally, of course, it was a different matter, and one could hear TS3 powered coaches and lorries approaching when they were still leagues distant. The TS3 engine developed 105 bhp at 2400 rpm, but as with other large two strokes, the torque curve was very peaky. Torque rose from 245 lb ft at 800 rpm to a maximum of 270 lb ft at 1200 rpm, but then fell away sharply to 225 lb ft at the 2400 rpm governed speed. Theoretically, the 3.26 litre two stroke TS3 equated to a four stroke motor of about 6.5 litres, though some efficiency and power losses inherent in the type, notably the requirement for a Roots blower to aid induction and scavenging of the cylinders, does prejudice a direct comparison. Nevertheless, as an illustration, the Gardner 5LW of 6.974 litres yielded 300 lbs ft of torque across the entire working speed range. At 1700 rpm the TS3 delivered only some 87 bhp against the 94 bhp of the Gardner. Even so, fuel consumption figures of up to 20 mpg were claimed for the TS3. The standard gearbox in the Avenger Mk IV was a four speed synchromesh unit, for which an optional overdrive was available, but a close ratio five speed constant mesh box was also offered. I am not sure which of these the Southdown coaches had, though I suspect the synchromesh. According to my records, the bare chassis weight of the Avenger was 3.125 tons, the maximum permissible gross weight being 9 tons. The maximum gross weight figure for the contemporary Bedford SB was 8.26 tons. The unladen weight of a bodied contemporary Tiger Cub was about 6 tons, which, with the full added weight for passengers, fuel, luggage etc, would raise this to a maximum of around 9 tons. Perhaps, as Ian suggests, the Avenger was in a similar weight category to the Tiger Cub rather than that of the lighter Bedford. I can confirm that my TS3 Rochester regularly achieves 18/20 mpg unless on a hilly route. Roger Burdett’s actual consumption of 18-20 mpg for his TS3 Rochester is very impressive. The power saved by having no valvegear to drive must be more than balanced by the energy needed to drive the Roots blower, and all those extra large moving parts look as though they ought to sap power, but evidently not. Since simple crankcase-scavenge 2-stroke engines—whether petrol or diesel—always show poor fuel consumption, it’s easy to assume that all 2-strokes are thirsty by nature, yet the most economical prime mover ever built was the Wärtsilä-Sulzer RT-flex 96C 2-stroke marine engine, which is well worth Googling, until it was recently just overtaken by a 4-stroke engine (model 31) by the same Finnish builder. Both these engines are admittedly a trifle bulky for a coach, but they show what’s possible. Roger, how does the consumption of your rear-engined Foden coach compare with that of other vehicles of a similar weight? Ian my Foden consumption is around 12mpg but is inherently more unreliable than the Commer. The fuel system is more complex with a hydraulic governor and to be honest has not had the use it deserved. My LS Gardner powered which is comparable weight is c13.5mpg. The Leylands do around 12 and the Midland Reds 10. As a rule all my Gardners do 13-14mpg whether 5LW; 6LW, or 6HLX except for my Tilling Stevens which with an overdrive 6LW does 17/18. The Commer is 3.1 litre with no overdrive but is incredibly fuel efficient as you say with the direct injection and a fairly low vehicle weight. The Roots blower once it is moving has far fewer parts than a a vehicle with valve gear. I do run the vehicle between 55-65mph on the motorway which always surprises speed limited modern coaches! Here is a picture of my TS3 Avenger IV The Commer stands at 11 foot high so does look narrow but it is in fact the height that creates the illusion. Yes 20 mpg is returnable without difficulty, as is cruising at 60 mph. I gather that it performed quite satisfactorily, and I wonder why others didn’t try this conversion. Today large two stroke engines fall foul of emission regulations, but the TS4 could have had its heyday well before those rules came into force. My father was test driver at Rootes for the TS4 and noise would have killed it as the harmonics were much greater than the Cummins. Let us not forget Cummins was part of Chrysler at that time and the V6/V8 production was only a small part of a big world wide conglomerate. I believe it was noise regulations of 1972/3 that finally killed off the TS3 and TS4. I would agree in 30 odd years of owning it is a well engineered reliable machine. I was working for Chrysler in Truck development at the time of the TS4. As we understood it, the TS4 greatly outperformed the Cummins V6/V8 in all aspects, but Cummins (a major part of Chrysler at the time) had invested a lot of cash in the V6/V8 and they did not intend to lose it! All the tooling for the TS4 had been ordered & delivered to the Whitley plant in Coventry, where it was put into store and eventually sold for scrap…brand new & unused. It was said at the time that caused the collapse and subsequent closure of Herbert Machine Tools. Cummins "Red Engines" had a number of unusual design feature. They were high speed diesels, which was a problem since drivers were not used to revving a diesel to get performance. In fact a special rev counter was fitted to the trucks with a green band (gear shifting range) and a blue band, complete with a sticker that read "Always drive in the blue band". All fuel lines were drilled into the block, so it was a "clean" engine on the outside, but a problem if you got a blocked fuel line. Originally fitted with rocker operated 3 hole injectors, they suffered a bit of fuel starvation. This was overcome by changing to 5 hole injectors, which were slightly taller than the 3 hole and so necessitated changing the push rods, otherwise, bent push rods and a very unhappy engine! How do we know this? Let’s just say put it down to personal experience and move on!! The V8 was 185hp and the V6 was 160 hp. I think the only production Dodge that had the V6 was the L600, low height chassis, whereas Guy Motors took the V6 for a full size truck (Guy Warrior I think). The failure rate on the Red Engines was huge and we had a large pile of dead engines in the Whitley compound (Chrysler truck development relocated to Coventry from Luton & Dunstable at the end of the 1960’s). I hope this is of interest to you. Thanks to David Field for the latest comments. The engine Guy used in the Big J was the VIM v-6 & Vine v-8. These were going to be built in the UK at the former Henry Meadows factory in a joint venture with Jaguar which did not go through. To bring things back to buses it was the Cummins VIM v-6 of 9.6 litres and 192bhp that was launched in the Daimler Roadliner. A further bit of trivia regarding the TS3. Lord Rootes was a man who was not renowned for great judgement or making the best decisions. For example, after WW2 he was offered a choice of German engineering businesses as reparation for the damage done to Rootes group factories in UK. His options were VW car manufacturing or a rather strange and obscure 2 stroke engine being developed for aeroplanes (Heinkel I think). He chose the latter, apparently on the basis that the VW would never prove to be popular! Does anyone know if TS3 engine PSV’s used the Maxiload oil bath air cleaner (located under the passenger seat on the truck) and the Cooper’s self cleaning muffler? Why I ask is because when the TS3 was stretched to 135hp in it’s final form (a stretch too far) one of the problems was that the blower shaft would snap. The first sign of this was a drop in power and the second sign was black oily smoke pouring out through the air filter – not good in a PSV. The quick way of replacing the shaft was to remove the radiator to get to the front of the engine. The front part of the broken shaft was easy to get at, but the rear part involved careful use of a couple of welding rods fused together and poked down the hole. The idea was that you would strike an arc onto the steel shaft and not the alloy block! I was wondering how you get to the front of the engine in both the Harrington and Plaxton bodies featured. The Coopers muffler would probably scare passengers and other road users half to death today. Carbon was allowed to build up in the muffler until a certain back pressure and exhaust gas temperature was reached. There was then a discernible loud pop as the carbon ignited and was sent out through the tail pipe, as a trail of sparks and sometimes even the odd flame. Very impressive at night on the motorway! The posts about the fascinating TS3/4 have been very interesting. Your point, David F, about the Coopers muffler spewing forth sparks reminds me of being in a express steam train, in the mid-1950’s, spewing out glowing smuts whilst climbing Shap Fell flat out at night. It was like descending into Dante’s Inferno! Not a time to put one’s head out of the window! Having had only fleeting experience of the Commer marque in my early days at SMS – 45 and 60 I think being the two we had at our depot – I really can’t think of a good word to say about them. The potential brake fade and a sound like an Atco powered football rattle were enough to put me off for life. However, from before my time, am I right in thinking that the first batch (pre-Harrington) were the notorious ones that eventually ended up derelict in Bognor Yard with brambles etc growing through them? There was a story that the design didn’t allow for the removal of the engine which was an integral requirement in an ‘E Dock’, and they were consigned to Bognor as that maintenance time came. Thereafter, anyone saying ‘Bognor Yard’ about something was immediately understood as meaning ‘throw it away’. This photograph was taken on 26 June 1958 at North Landing, Flamborough, adjacent to the terminus of the East Yorkshire route from Bridlington. It is one of my very first transport photographs, taken during a family holiday at Flamborough. 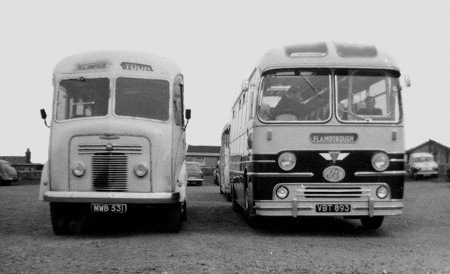 One attraction would no doubt have been the nice shiny coach on the right, new that year to Boddys. They had two other Yeates bodied Reliances that year, VBT 191 and VBT 192, of which VBT 191 is currently preserved with Fowler of Holbeach Drove. 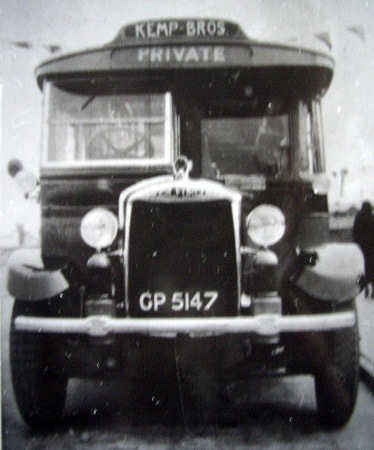 The other coach MWB 531 belonged to H. G. Anfield (also of Bridlington?) this is a Commer Avenger I with a Plaxton C33F body, and was new to Sellers of Sheffield, and it was number 7 in their fleet. I presume these would have been on half day tours from Bridlington? A most interesting picture from a very well loved area. Firstly, yes, Anfields were from Bridlington, and operated from very basic premises behind the Gas Showrooms adjacent to the railway level crossing in Quay Road. The question as to whether the two coaches were on any kind of excursion from Bridlington is intriguing as the journey is only about four miles or so each way and could be accomplished by frequent service buses – perhaps the ultimate destination was Flamborough after a longer scenic ride beforehand ?? Another thought arises too – I wonder if the Anfield operation and vehicles had recently been taken over by the much more prosperous and presentable Boddy’s ?? That`s another old Bridlington independent. I remember it from earlier days, about 1946. Did they not have a stage service about that time from Filey to Flamborough? A Bradford neighbour had a PLSC Lion bungalow just under the old lighthouse, about 100 yards from where the photo was taken. I remember Mr Brock, the owner, telling me it was purchased from Boddys, but I also remember him telling me it was purchased from a Bradford yard in 1946, so not sure whose it was. Did Boddys also have an ex YWD or West Riding centre entrance Roe TD2, or am I mixing memories with Williamson??!! John, I don’t remember any independents having a service from Filey to Flamborough to be honest. Similarly I can’t recall Boddy’s having double deckers, but there WERE no less than seven ex YWD centre entrance Leyland TD2s in Bridlington. White Bus Service had HD 4625 and 4631. Williamsons had HD 4629/4630/4801/4803/4810. The latter was an incredible fleet considering that only two vehicles were needed to operate the town services to Old Town or Queensgate – and there were always a few interesting single deckers in stock as well. Thanks Chris for the Williamson/WBS detail. My memory is very blurred, but I remember the centre entrances so well, and have this vague recollection of riding on one well outside Brid, the other side of Flamborough. Did WBS run past Flamborough? My main memory of Boddys is as you say, a coach company. I intend checking the OS archive regarding these 2 fleets Chris, but I think this may not be necessary as you are a mine of information here. Very grateful for it all. Many thanks John for your kind appreciation, but do please make whatever further checks you can – I’m afraid that advancing years mean that output from the "mine of information" reduces from time to time and sometimes contains samples of "nutty slack." !! Your journey with WBS will no doubt have been on either HD 4625 or 4631 and the WBS service to Flamborough did have two distinct branches at the outer end – one to North Landing and the other to Lighthouse – which may have given the impression of further territory although I am not aware of the Firm ever having ventured further. O frabjous day, etc, etc. What a joy to see actual photos of John Boddy’s fleet. One of my favourite fleets of my younger days. I well remember, staying in Brid in a flat in West Street, overlooking his Garage on the corner of New Burlington Road. Every morning at 8am the doors would be opened to reveal a wealth of red and cream vehicles. He also has another garage down Horsforth Avenue and one in Hull, at Morrill Street, off Holderness Road. As far as I am aware he never operated any stage services, but many trips to the local area. Mr Boddy also operated a fleet of taxis, as he would personally collect my late grandma, from Brid station to where she stayed for 3 or 4 months each year. Just as an afterthought I am trying to compile a complete fleet list for Boddy’s, but I believe there are a lot of vehicles which were purchased for spares or rebuilding, I’d love to hear from anyone who has a complete list. I can give Keith just two snippets of information which may be of interest. 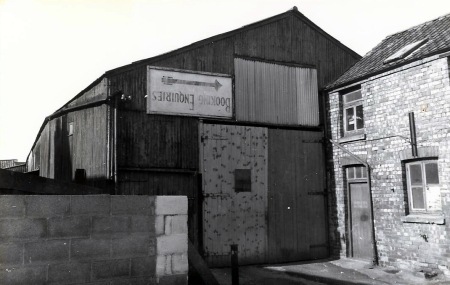 Boddy’s also had a very tiny garage for two or three vehicles at the Town end of Hilderthorpe Road – it is still there I think, but I can’t remember just which business occupies it now. Also , unknown to me at the time and I could kick myself, Boddy’s had an ex Samuel Ledgard Leyland KP3 Cub with Ledgard B20F bodywork, one of a batch of four built in the famous Armley workshops. It was UG 521 of 1932 and was sold to Boddy’s in 4/46 and then sold to Freeman of Brough in 11/46 who sold it to Thompson of North Newbald in 6/54. Chris (Y), thanks for those two items. Boddy actually had both UG 521 and UG 522, both acquired august, 1946 (before my time) 521 was withdrawn May, 1950, and 522 by November, 1948, this one is listed as going to Bailey of Fangfoss. I’m not certain, but I think the garage in Hildethorpe Road, is now owned by a small local car dealer, whose name escapes me at the moment, was it opposite the end of Station Approach (now the entrance to Tesco’s)? Interesting views indeed Keith and, as sometimes happens, both conflict with PSV Circle records which show 521 as I mentioned above, and 522 as sold to Bailey of Fangfoss by 5/47?? The little garage in Hilderthorpe Road must be yet another premises, as it is on the same side as Station Approach but much nearer the town centre, in a very small yard, just before the road turns sharp left into Bridge Street (I think it is) to join up with Queen Street near the Brunswick pub. If only we could turn the clock back and finalise these things it would be so very satisfying. I am very long overdue for a visit to friends in Bridlington and must put this right as soon as the daylight prolongs and the weather improves. Thanks Chris, I Know exactly where you mean now, but what it is now, I’m not really sure, it’s in what is now the tattier end of Hilderthorpe Road. UGH 522 date may be a bad transcription on my part, as I took the details down in a rush. Incidentally I still remember the White Bus stand in Queen Street, Ah happy days! If only I’d been a little bit older at the time I’d remember more of what is now gone for ever. Brid was a beautiful town in those days. Regarding Anfield, I don’t really know what happened to him, as far as I am aware, he was not acquired by Boddy’s. Obviously he was still operating in 1958, when the photo was taken, but I have no recollection of Anfield vehicles in the late 50’s. Keith and Ian – Thank you for further most interesting reminiscences of the Good Old Days in Bridlington. I’m not sure if Appleby’s took over the Queen Street office of WBS direct but it seems most likely as I believe they did take over Boddy’s operation in the town. Boddy’s also had a booking kiosk in the Promenade somewhere nearly opposite the Grand Pavilion Theatre. 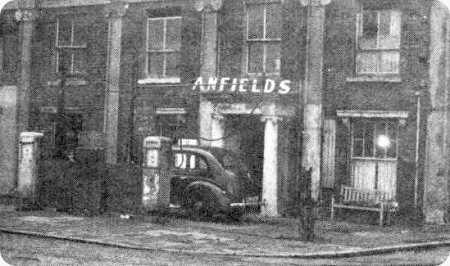 Here is one of my own amateur teenage snapshots of Anfield’s Quay Road premises, around 1951/2, with some fascinating gems to be seen. Boddy’s had the small end building on the promenade close to and almost opposite York Road which was the same side as Pavilion I recollect Appleby’s using this for visitors trip bookings with boards standing under a window for York City Various Abbeys etc. The adjacent open area allowed coaches to pull on and park up to load. Boddys often had that lovely ex West Riding coach on there I think it is preserved. Behind this open area was a high wall where a side lane ran down to the Thorn Road Coach Park for out of town coach parking. 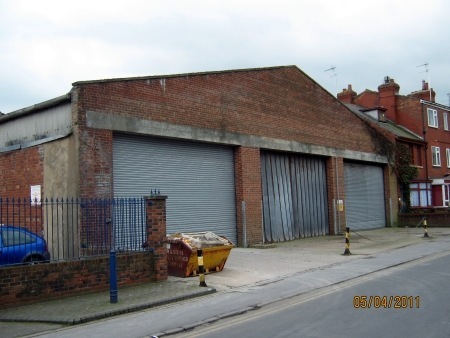 Incidentally York Road opposite side of Promenade had a huge premises of Garage and Ice Rink above. T&W ran 6d circular tours around the area for visitors and locals. One route ran up to Flamborough via Sands Lane, Limekiln Lane, Sewerby, 1921-ish. This route was one that Reuben Williamson was trying out (Stage Carriage)with a Double Deck Motorbus, However Charles Williamson, Reubens Son, (aged over 80 when I met him) told me that due to the competition of T&W (who were basically Pirates-well it is near the Sea!) Reuben’s revenues were poor that Williamsons gave it up, returning to the two routes of Old Town-Quay and Queensgate – to Town. T&W got their reward when as they overstretched the finances owing for petrol and had to sell out to Archer Robinson in 1924 (Robinson’s story is quite interesting he never worked his staff on Sundays-but if you lost a spanner from the set of tools he provided for Roadside repairs he stopped 6d a week from your pay to pay for another one) This in turn let Blue Bus in as they had no qualms about Sunday Ops. So I will let you digest this. Hi Chris & Ian, what a wonderful "can of worms" this topic has unearthed. With regard to Boddy’s Hilderthorpe Road garage, I believe it is the one which is set back behind a shop which is now called "Bygones", as I had a drive-by last week, but couldn’t stop as I had Mrs E. on board and she was keen to get on, but if I’m correct, it has been used by, if not still by, a limo hire company. I like the picture of Anfield’s garage and vehicles, but I still have no recollection of him at all. With another query; who owned the enquiry office at the Spa end of West Street, as I recall seeing boards leaning up outside advertising Boddy’s tours and excursions? I believe that a guy called Gibbs related the T&W, Robinson etc, goings-on in a book on EYMS!!! I recall the enquiry office on the Promenade, at least when it was Appleby’s. Boddy sold out to Appleby’s in May, 1983, which gave Appleby’s a foothold in both Hull and Brid, but I’m not sure where their Scarborough ops came from, unless it was post de-reg competition. In the early 1990’s I recall passing the Horsforth Avenue garage, with 3 Appleby coaches inside. Incidentally does anyone have an Anfield fleet list, as I know of only 1 vehicle! Here is the shot that I forgot to attach to my last posting. Thanks a million for that fabulous picture Ian – the garage and yard were behind that imposing building which I’d forgotten all about long ago. I shall treasure the memory I assure you – another important piece in the Bridlington transport jigsaw!! Trying to find the location of Anfiled’s premises on the photo! Where was it Ian? The nearest I can guess is just north of Quay Road crossing north of Moorfield Road, adjacent to what is now Higgs & Barker. Am I close or not? Anfields garage was at the rear of the building on photo it is as you thought Keith Moorfield Road went up the side towards the rear of Moorfield School at the far end was a White Bus Garage which I believe only took single deckers. There were four very dilapidated cottages built adjoining the Anfield Garage all were demolished. I am seeking further advice on the matter and will post any details. One puzzling query for you Keith re EYMS Fleet Listed on it is YX 5215 Dennis E – no further details given – I emailed EY about this bus around 2 years ago but no reply – I offered a possibility for this Dennis B Coach – Hale Garage and Coaches were bought out by EY in 1933 (the date given by Fleet History) so did this vehicle come from Hale? Just a guess but I was sorry that no response came back. Can anyone confirm the source maybe PSVC have some record. Perhaps I should produce some booklet or other on Brids Passenger Pioneers Motor Buses began in 1905 so rival Ezra Laycock. Brid being a Seaside Resort had many Pirates or Entrepreneurs shall I say, One ran a Serpollet Steam Bus in 1910! Ian & Chris, Hi, thanks for the confirmation on Anfield’s garage & premises. Now for YX 5215; I’m basically responsible for this one, but there is no official confirmation by the company, indeed their historical records commence in 1987 (when privatised), the details on the website prior to this date is basically from my fleet list, as supplied to John Whitaker (see Leyland PD1 JAT 455 – 487). The Dennis did indeed come from Hale Garage, and was East Yorkshire’s share of the vehicles. I came across the details shown some time ago, in Keith Jenkinson’s book on West Yorkshire, or if not there, I cannot recall where it was. I would, of course, welcome confirmation or correction of the matter. I, personally would welcome a book on Brid’s motor-bus heritage, if you could ever get around to it! Ezra Laycock was the first bus in West Yorkshire, and it would be good to know that Brid had the first bus in East Yorkshire! Ian, we eagerly await your Bridlington booklet so please begin writing as soon as possible. To those of us with such treasured memories of the Town and its fascinating transport such a work would be very welcome. I think I’ve mentioned this incredible little fact before, but I daresay it stands repeating – as a sign of respect to the Sabbath the Williamson’s bus stop pole in Chapel Street did an astonishing switch on Sundays. On weekdays it was located in a pavement socket right outside the Chapel front doors – but on Sundays it was moved lower down to another socket nearer to the Promenade junction – Mr. Wesley and others would have been very impressed indeed. Keith. First, many thanks for the EYMS list which I am gradually absorbing with glee! Ian. I think a booklet about Bridlington`s bus pioneers would make fascinating reading. From the EYMS list, there were several takeovers in the region, including the post war ones of Williamson, but who were "Blue Bus" and "Bridlington and District"? Its a truly fascinating history, and, for me at any rate, crammed full of nostalgia! Does anyone have a photo to post of the Doncaster "Renown" running for Williamson? I look forward to many more posts on the subject. Just wish I could contribute more, but my memories of Brid are from regular holidays there up to about 1955, and then much less frequently. Hi Ian, back to YX 5215; The details quoted are those when owned by West Yorkshire, with the exception of the bodywork. For origins see your book on EYMS, page 28. When it passsed to WYRCC, it was rebodied with a Brush B31C body. It is possible that this was a second-hand body, and as such it may have caried the YX mark, which was, of course, a West Riding mark anyway. If this is the case, the registration when acquired by East Yorkshire, would have been different. Chris, Blue Bus, was Archer Robinson’s company which was acquired by the LNER (indirectly) and passed to United, along with Bridlington & District and Scarborough District. In 1930 these three companies, due to their locations, were split between East Yorkshire, West Yorkshire and United. Thirdly Ian, I think that you are now committed to a "Brid book" or you will have at least two very disappointed enthusiasts! p.s. Sorry Chris, I meant John (W). Incidentally Archer Robinson, built a cafe at the terminus of his route to Flamborough, North Landing, I believe that it is still present today, or at least there is a cafe there in use, at the end of a very bumpy ride. Sorry John, but I don’t know of any photo of the Renown – however I do have a Robert F. Mack picture of the Leyland Titanic from the same town making a spirited turn from the Promenade into Queen Street – with a remarkable display of exhaust fumes to show that it means business !! Do submit it for us to see, Chris Y. You can’t beat a photo with atmosphere, even if the atmosphere is about to choke all around the Titanic! Yes Chris, please do! I had no idea that there was also a Titanic! When did White Bus start up, and Williamson for that matter, after EY had absorbed (presumably) all the Brid area independents? 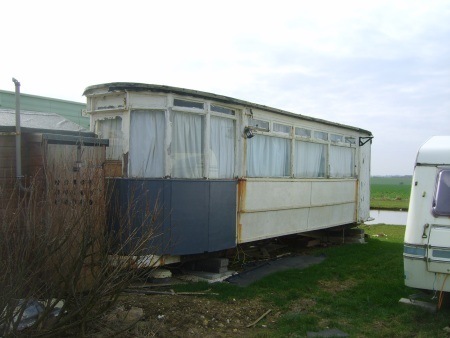 I remember Doncaster 6 wheelers of both types used as Skipsea bungalows c. 1950. Perhaps these were connected with WBS in some way, or maybe just a coincidence. There were 2, still in Doncaster maroon, lined up on the cliff top minus engines, but otherwise intact, and later they were painted up in their holiday home colours. Chris contributed his shot of the Williamson’s Titanic, but I do not want it to be just lost in a long list of comments so I have uploaded it as a separate posting but it is here as well to keep this thread going. Chris. Thanks indeed are due for this wonderful picture! I wonder if this is the bus, or one of `em which finished up at Skipsea? Like you say, torque converter with 3 axles must have made them expensive to run on such a short urban route, but I suppose they were more modern than most second hand availability at that time? Presumably the TD2s were in stock at the same time, or did they replace the Doncasters, as the TD2s ex YWD survived until the takeover. Absolutely fascinating! Several large Sheffield double deckers were on the Caravan site on the Marton Road Camp owned by Mr Mortlock possibly the Titanic went there. 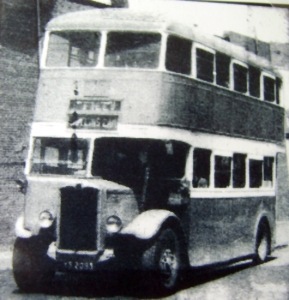 Re White Bus Service they began with two Ford Charas according to John Boddy, for visitors in the area. White Bus Service replaced the 2 Fords (TT Baicos?) with 4 Lancia Z types. All were charas named after Musicals of the 20s. Archer Robinson DID have a cafe at Thornwick to provide Patrons refreshments, Incidentally their Lancias had to go in reverse near the cafe as the petrol flowed backwards from the carburettors uphill, whilst the Horse buses passed them! In the letter John Boddy Jr States that John Boddy & Son agreed to buy Town Licenses from Williamsons, Both EYMS and Bridlington Borough Council objected on the grounds that the service could be more co-ordinated if EYMS bought Williamsons. Following the sale of Burn’s Grey Bus Service to EYMS, the former owners (with £7,100 in hand), being Messrs’, Burn, Tyler and Solly, set up the new business "Grey-de-Luxe Luxury Coaches" (with Eric Russell joining later). The Grey-de Luxe name came about because David Burn bought an ex-Motor Show coach in c1927 it had a Maroon & Grey Livery. Finally in the above letterhead for Grey-de-Luxe mentions objections to Christmas Day Service in Hull 1931, (I believe one of the objectors was ‘Kingston Motors’) who were running up to Hessle, so their Route would suffer losses over Christmas, EYMS bought ‘Kingston Motors’ out as ‘Hull City Motor Works’ in June 1932. If there is interest in Burn’s and Co I have a picture of the new owners with their Coaches. Chris on my copy of the photo of the Titanic, the display clearly reads "The Quay and" the bottom line appears to be "Queensgate" but it is not very clear. Ian, of course there’s interest! Any local operator (Hull & East Riding) is of interest. On another matter no-one picked me up on this, in my post on the 13th, Archer Robinson traded as Green Bus, which became Bridlington & District, whilst Blue Bus was J Atkin’s company, otherwise the remains of my comment stands. Sorry for the error, but the grey cells are a bit rusty. Thx, Chris Y, for posting the Titanic. I see your point about the trail of exhaust smoke, blurring Montague Burton’s establishment in the background! It’s a very modest building, compared with most around. And I like the name of the Gipsy Lee shop, whatever it sold! I fully agree about Leyland’s risky choice of model name for these vehicles. Maybe this is why AEC’s Renown had higher sales! I have the photos above of BT 9820 which in the PSVC list is quoted as a Dennis ex Enterprise (Fussey) of Cottingham, but the photo here is definitely a Leyland. Any Ideas? As for BT 9820 I too noticed this when I compared Fussey’s Dennis and this picture of the sale to EYMS of Burn’s Bus Service. David Burn was in the frame in a suit I recall. I reckoned that someone swopped Plates after the Fussey and Burns sales took place, if the ‘Enterprise’ Dennis was taxed but not a runner and the Leyland was serviceable well save a few bob, We can only guess! The ‘Enterprise’ name was due to the 1926 Strike! Tom Fussey ferried Naval Personnel to and from the Docks, during the Strike. He befriended the Captain of HMS Enterprise, so applied the ship’s name to two vehicles. The 2 Daimlers EYMS acquired with the Dennis’s may have had Logos, these were Nully Secundus and Non Pareils. Tom Fussey began with Horse Buses taking over from a Publican. Paul H – I bet her crystal ball needed a good wipe over every time the Titanic passed by! Ian, and other interested parties, I suspected that this was a Burns bus, by the destination box which reads "Hull & Withernsea" This vehicle is not recorded in the PSVC book PB17, perhaps this remained with Burn along with the Leyland Lion BT 9981. This would make Burns total fleet size 8 vehicles. With regard to Fussey’s Dennis, I very much suspect that I have the same photo as you as mine is identical to the one in your book (page 15), however I did try blowing it up, and whilst not being 100% certain, the registration could possibly have been BT 9520. I did query this with the PSVC and they confirmed the BT 9820 mark, but perhaps this was a bad transcription by the motor taxation office? Keith and all, Dennis BT9820 is on page 15 of Dennis Buses in Camera a better picture of this very Bus. As you say correctly the Leyland is Burn’s is it carrying this plate in EYMS control 1927? used for Withernsea Services by them? Going back to Archer Robinson (Green Bus/Bridlington & District); his garage in Brid at Cliff Street is very much in evidence even today, but is in use as a cafe. It is located on the corner of Cliff Street and Cross Street. Ian, does the photo of the Dennis, in the book, show the registration plate any clearer than my small photo? Also you mention your BT file? this and any other similar files must be very interesing indeed. Chris, Keith, John re Anfields The Higgs-Barker Forecourt was built on Quay Rd site, Anfields land had 4 houses, known as Bishops Terrace, next a Cinema, then Anfields garage. Keith Archer Robinson Garage, There was a photo of it in EYMS files! The Dennis photo in Camera BOOK is a good one. My files are the result of years transcribing data by hand for my Vehicle data and meeting bus men (on my Moped). In 2010 I was told it now costs TEN pounds for a single search per document for photocopy or email! can’t afford it. Incidentally I lost a folder in 1980 It held Licensing data from 1911-1926 for buses drivers conductors in Hull hand copied (Own fault) If anyone’s found it-Likely!! let me know! Too much about me this is a bus site. Hello all. I have been reading your comments on Bridlington area operators with interest, and yes I would like to see a book about Bridlington operators, that’s about four you have sold now Ian (I did buy both copies of your EYMS book and supplied several pics for the book!) I visited Anfields depot on 16-5-65 looking though the side door of the new garage building and the following coaches were parked in there as well as several cars, LJR 554, 3529 BT, 3205 BT, LNP 892 & RWF 714, but I did not have my camera with me when I went Bridlington old bus garage hunting last year. I have sent the pictures above of Williamson ex depot at 25 Havelock Crescent, 16 Havelock Crescent was also an address of Williamson but is a house now. Mike Davies and all, Interesting pictures of Havelock Crescent Mike you have reminded me I might have a photo of the Williamson garage when the GPO rented it. Re Titanic bodies Mortlocks Camps there appears to have been more than one bought for parts cannibalised towed to camp wheels removed taken back to depot. They were popular for camping being large there was room for a better kitchen. I worked for Boddys coaches for many years and can confirm about 1968/9ish Boddys took over Anfields with 3 coaches ie 4777 VM, 319 FWB & 3529 BT which was always breaking down, also Boddys sold out to Applebys at the Hull depot a year or so before selling the Brid business. Hello Ken, I was talking to Dave Longbottom last summer about Boddy’s Coaches and he mentioned your name, as being someone who had kept a very detailed record of the fleet, including buses acquired for spares or rebuilding. If you still have this information, and it is readily accessible, I would be very interested to see a copy of it, if at all possible. I can be contacted via Peter at the website. Many thanks Keith. Yes details of vehicles acquired for spares by Boddys would be very interesting, Ken. I can confirm that Boddys and Anfields coaches would both have been operating an afternoon tour to Flambro North Landing and then on to Flambro Lighthouse and back for tea, then maybe a mystery trip in the evening, both companies ran in competition to each other. I am working my way through the comments and can confirm that Boddys ran a service probably starting at Filey via Hunmanby Cortainly Speeton Buckton Bempton to Flambro this info came from John Boddy jnr and older staff members as a result of me finding a stock of bell punch tickets in a cupboard during a clear out. I do not know what buses were used, the service was run by EYMS by 1966 when I did 2 seasons working for them before I started at Boddys, what many folk don,t know is both Boddys and Anfields, bought old buses both d/d & s/d to sell to folk to make holiday homes, that is why there where many on the local camps. However earlier on during shortages of buses in the 2nd world war many of the earlier holiday homes were repurchased and remade into buses I was told of a Anfield one reversing out of the garage with the paint still wet and a chimney still on the roof. Boddys acquired a ex Sheffield Leyland PD2 in the 1970,s purely for the engine to put into EHL 336 it only stayed a few days as we did not have garage clearance for it and DTY 442 towed it away to a scrapyard at Worksop were they were both broke up. Very interesting Ken do you know any registration numbers for the buses turned into holiday homes or the Sheffield decker ? 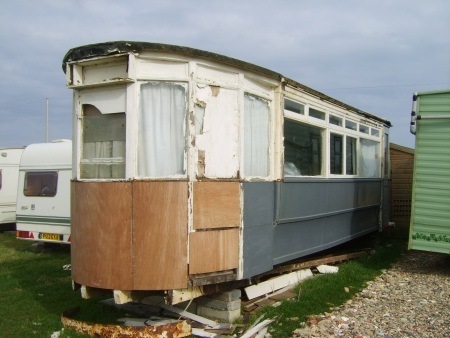 I believe Boddys acquired KHCT’s RH 8473/8475/8476 & 8477f or spares in 11/45 – did these also end up as holiday homes? Thanks to Ken, the origin of the Flamborough PLSC Lion bungalow of a Bradford neighbour can be confirmed! I well remember being told it was bought from Boddys, even though I have never seen a PLSC reference in their fleet. Thank You Ken, also, for the confirmation of Boddys Filey to Flamborough service, which I was sure I remembered riding on, and not quite as sure remembering it as a centre entrance bus. Perhaps on its way to Williamsons, as I am talking about 1947. There was still a tram body at Skipsea up to recent times, not sure if it is still there, but it did appear in the background of a recent "South Riding"series. There are a lot of old sheds and caravans, but I doubt if there are any buses left. Re. Mike’s comment about Skipsea: From 1948 to 1963, we had a Bradford tram body at Skipsea, until the sea eroded our little patch of land! N.Western RC TS, West Yorkshire TS B10A, Yorkshire Trac. 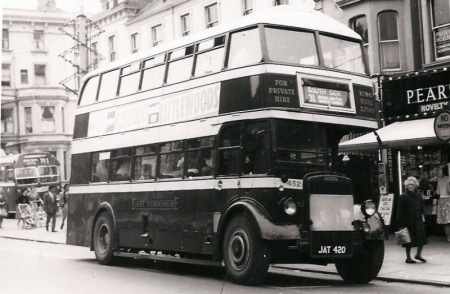 TD1 (Enclosed), Bradford 6 wheel "Paddler" trolleybus, and the 2 Doncaster 6 wheelers, one of which I think, was an AEC. There were plenty more further away, along with sheds, railway coaches and tram bodies galore! Just wondering how many of these buses were supplied by Boddys??!! I would very much like any details of the Anfield-Boddy fleets too Ken, also your input re any notes I submit-thanks in advance. In my 1951/2 photo of Anfield’s yard, which appears earlier in this topic, there is an ex Doncaster six wheeler against the left wall in the view. 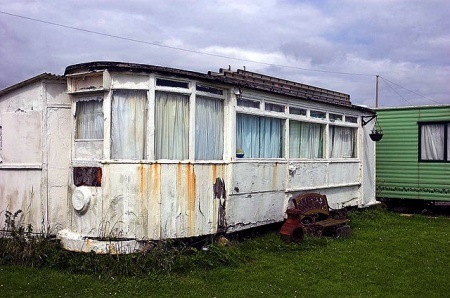 The bus was in "as arrived" well worn maroon and I’m sure was never used by Anfield’s, and so I suppose its likely that this was one of the many destined for the coast and for use as a holiday or permanent home. I never noticed the "Doncaster" at the side of your Anfield’s depot view Chris. Brilliant. I bet it was one of the duo which finished up at Skipsea! They would make a very durable holiday home, especially being teak framed! This tram body was still at Skipsea and may still be on site. I went to Skipsea today (Saturday 12th March) and can confirm the tram body is still there, but no buses!! Hi Mike. The tram body photo takes me way way back, and I am amazed that it is still there! This is a Hull car by the look of it, and probably not one that went to Leeds with it being a 3 window car, although I think some 3 windows did get to Leeds. Imagine what Skipsea cliff top was like in the post war years to about 1965, when all the delightful old buses, trams and railway coaches adorned the cliff edge, from the edge of the bombing range towards Atwick, right down past Ulrome, almost to Barmston! I often make the walk in my imagination, to see if I can remember the detail of any others which I have not mentioned, and feel sure I remember this Hull car as being quite near the Atwick end. Maybe wrong, as I can remember other Hulls. Thanks for going, and thanks for reviving all those memories! 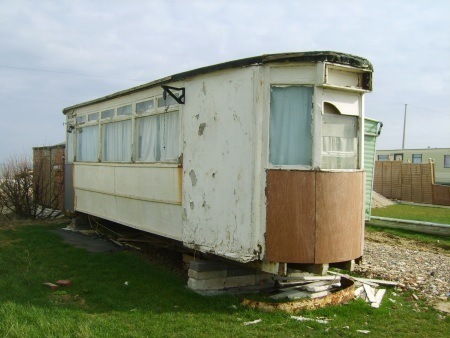 The East Yorkshire area in the 1940s/50s was an absolute Mecca of holiday residences which had once been passenger vehicles. When I was in the RAF at Patrington in 1955/6 the A1033 from the village to Withernsea, and the Spurn peninsula in general hosted some magnificent withdrawn vehicles from the prewar days. A particularly rich site was on a sharp bend known as "Hollym Corner" – why oh why didn’t I take some pictures of PLSC Lions, Gilfords and other gems ?? Mention of Hollym Corner by Chris Youhill, reminds me that on Hollym Road Withernsea, was Kemp Brothers Garage I send a copy picture of a 1931 Gilford 1680T, ch 11965 owned by Mainline London, It came to Kemp from Mainline – date not known to me – someone is sure to know the details, if so what is the source please, also I believe it was rebodied by Barnaby’s Hull c1943. Hello Ian. My records for Kemp, show GP 5147 coming from Mainline No24, as you said, date unknown, it later passed to Blue Line, Armthorpe and was rebodied by Barnaby DP26F in 1943, so it must have left Kemp by 1943. There is a photo of it in Prestige Series-Doncaster 1 with its Barnaby body, with Blue Line. Just to refer briefly to another fascinating feature of the bus scene in Bridlington – who remembers the UNITED bus station in The Promenade, from where their service 111 used to leave for Scarborough via Speeton and Hunmanby. A bus station it certainly was – for ONE bus !! It is still there and is on a corner roughly opposite Garlands the newsagents. The former United office is now a cafe, and customers in fair weather can dine "alfresco" on the very spot where many a fine Bristol G, K, J, L has rested during layover time. Yes Chris I remember it well a one bus bus station, no room for a dupe!!. Hi Mike Ken Chris. What an interesting set of new notes everyone, Mike I would be interested to compare your fleet notes for Kemp, re Blue Line I have the same book, is there a psvc publication for Blue line? Roger Holmes and I corresponded 1985-2003 about Barnabys and South Yorks firms who bought Barnaby products. Fascinating stuff this Ken Boddy’s Filey operations and excursions, far more than I realised. Kemps had cars for Funerals. Fred Barnaby rebuilt Limos into Hearses on the side carried out by a specialist who worked on Rolls and Austin V-Plas. They made a replica Jowett Jupiter body for 1952 Rally, chassis from Armstrong’s Beverley. I did a short piece on it for Jowett Club. Chris I remember the United ‘Bus Station’ somewhere I have a copy of a picture when People’s Bus of Scarborough used it, if I can find it I’ll put it on site. Gentlemen : please may a newcomer join in your fascinating discussions? Because this newcomer, having stumbled upon your website accidentally while looking for something else, has clear memories of most of your topics, having been born and bred in Bridlington (1938 – 1955)! And I can probably fill in a few gaps in your joint knowledge. Switching topics, ah, those ex-Doncaster double-deckers: 5 of them passed through Anfields’ yard; the 2 which went to Williamsons (DT 9643 and DT 5332? or 5337? ), plus DT 7812 (Leyland, DT 9857 and 9859 (AEC) although a Doncaster Corp. fleet list I’ve seen gives the latter 2 as 9757/9. And that wonderful photograph of Anfields’ yard! That’s DT 9857 or 9859 on the left, then HL 5814 (a former Bullocks (156) Leyland Lion LT5 chassis re-bodied (make unknown), the old body (complete with Bullocks destination blind (why didn’t I have the foresight to "borrow" it) stood around in the yard for some months, suggesting that Anfields must have removed the body before sending the chassis for rebodying; then CWF 490 (one of 5 Bedford OWBs to be seen in Brid., the others being with White Bus (2), Boddys (1) and Everingham Bros.), then VN 5692 (a Commer B40 with canvas roof), and I’m not sure about the one on the right but I suspect it’s JV 6964 (Dennis Lancet2). 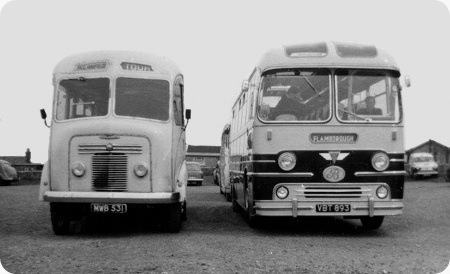 I’ve got a similar photograph from around the same period (sadly of inferior quality, black&white taken on a box brownie) showing a TSM HSLA4(GLY446), a Leyland Cheetah LZ (DOR 57) and a Leyland Tiger TS2 with a weird Mulliner body. Re Boddys’ Filey Flamborough service, yes, I can confirm that this did exist, I remember my Mother reading out to me the notice in the Bridlington Free Press about it’s being started, I would guess that would have been around 1947. For how long it operated I don’t know; my impression was that it folded eventually. Re the ex-Yorks. Woollen centre-entrance Titans, yes, Williamsons operated the 5 you mention, and White Bus had 2 but only operated HD 4625, not HD 4631 which I imagine they used for spares, because it disappeared without trace. Incidentally, in addition to the Moorfield Road garage, which as you rightly say could only take single-deckers, and only 2 at a time at that, they had a bigger garage in the Old Town which housed about 6 buses including double-deckers. And I confirm that the Queen Street offices were not taken over by Boddys, but sold off and I think became a shop. I reckon that’ll do for now; but there’s plenty more I can tell you. I’m sure that everyone joins me in welcoming Patrick to the website and in particular to this utterly fascinating Bridlington topic, which is quite rapidly approaching the status of a book !! On my old snapshot of Anfield’s yard – Patrick mentions two possible numbers – the ex Doncaster six wheeler was AEC Renown DT 5337. Eagerly awaiting the next instalments from everyone – I wonder if arrangements could ultimately be made for some kind of a gathering of those of us interested in the erstwhile Bridlington district independent operators to discuss the history and to assemble an archive of photographs. Many years ago I did put an appeal in the "Free Press" for any pertinent photographs – there must surely be many in the Town’s attics somewhere – but sadly and perhaps understandably there were no replies. I was contacted , however, by an elderly former Williamson’s driver (one Harold Dowson) and spent the day with him – he managed to introduce me to a lady in Brett Street who was a relative of Tim Williamson but sadly she had no material to show us. Hi All, Yes I do remember the United bus station, but I must admit that I had completely forgotten about it, until I read the post. Ken, did Boddy’s run a taxi business also, as I’m fairly certain that I remember my late grandma, telling me that every year when she arrived in Brid by train from Hull, she was picked up personally by Mr Boddy Sr., or did I imagine this? On page 44 of Ian’s book on EYMS there is a photo of EY PD1 number 452 on the Promenade in Brid, to the left of the PD1 is an United bus situated in the United bus station, showing route number 111. I’m sorry that I don’t have a copy of it. Firstly, thanks to all contributors for such a great response to my original photograph – your knowledge is absolutely amazing! Secondly, Ian, Mike, I can add the following information re Gilford GP 5147 – there is a Blue Line fleet list within Circle publication PB29 History of South Yorkshire PTE Part 2 1979-1986. This and 2PB13 Part 1, 1974-8, both published in 1993, contain full fleet lists of all independents acquired by the PTE in that period. Both Parts 1 and 2 are still available from the Circle. GP 5147 is given as new 7/31 to Main Lines Ltd, London WC1, no 24 with a Wycombe C26F body. Acquired by Blue Line by 1933, rebodied in 1943 with Barnaby d/p body (seating not given). Withdrawn by Blue Line 3/50, then given as scrapped. Looks like the Circle is unaware of it ever running for Kemp! This site on Bridlington operators is getting bigger and better each day. I have a list of operators in Bridlington with some vehicle details from the 20’s & 30’s does anybody know any more about the following ? J Burrell, (Bridlington Garage Co). no address BT 380/BT 381/BT 1511. J Broumpton, Beverley House, Pinfold St, BT 2816/BT 2878/BE 9189. BT 2807/BT 9952/AT 7417/BT 3304 WY 6253/NW 1759. D Day, Danescliffe, Thirsk Av. H Ripley, 35 Promanade. BT 4227/BT 5880/AJ 4779. I know not all of the above numbers are PSV’s and some operators listed may be dealers or NPSV. Boddys did run taxi,s latterly this was one car a Ford which Mr Boddy snr ran himself but there was also a 2nd car hardley ever used but as Mr Boddy snr had reached the age where really he should not have been driving, he had a few scrapes, and on Mr Boddy jnrs orders the 2nd car was hidden from view, Mr Boddy snr then took too painting the West St garage until he fell off a ladder. Boddys had horse drawn Carriages/taxis and the stables were at West St, I think this is how the car hire business started, Mr Boddy snr held hackney Carriage/taxi badge no 1, at one stage in the 1970,s we hired a garage in Marshall Ave to house the cars from Mr Naggs another old horse drawn operator, we needed the space in West St to house coaches. WF 7184! "I remember it well"; and I never thought I’d be writing about it 60 years later! When I knew it, it belonged to D.W.Frankish of Brandesburton, and freqently appeared in Brid., painted in colours (navy and primrose)which appeared to me to be identical to those of East Yorkshire, hence I wrongly concluded that it must have originated with one of the numerous fleets taken over by EYMS, and was unbelieving when, after I wrote to them asking about it, they responded that it had never belonged to them. It was a Bedford WLB, and I subsequently discovered that Frankish had acquired it in 7/47 from Clarke, North Frodingham (who perhaps had bought it from F.Burrell if Mike Davies’s info. is correct) and eventually sold it to either Wood or Thompson (no other details known). Now, then, to pick up a few minor points in the foregoing exchanges: John W.- in my living memory (which goes back to 1943) White Bus Service operated only to Lighthouse and North Landing, via Sewerby and Flamborough (with short-workings to both the latter), and hence those are the only places where you could have ridden on the ex-YWD HD 4625 (unless it was used for an excursion, which seems unlikely). But finding WBS Commer MJ55 open and unattended in the Station yard one day, my brother and I daringly ventured inside and turned its destination blind, to find "Scarboro’" included on it; enquiries of my mother elicited the opinion that WBS had indeed operated to Scarborough at one time. Does anyone know any more about that? Ian – there’s no such road as Thorn Road in Brid., the coach park behind the one owned by Boddys belonged to the Thorn Hotel. By the way, there was a third coach park in that vicinity, on the opposite side of the Promenade, owned by Mr.Carvill, and used largely to accommodate Wallace Arnold and Skills’ coaches. The reference to YX being "a West Riding registration" has me perplexed – surely YX was always a London registration!? WX and YG, amongst others, for the West Riding. Ian again – the Grey-de-Luxe Leyland Lion was KH 4071, sold in 12/40 to Boddys, broken up by 02/44 so I never saw it. Mike again – you mention an operator H.H.Knaggs; probably co-incidence but possibly not, WBS had a driver Mr.Knaggs (he always drove HS 8306). Re the Doncaster area independents – there are two marvellous books in the Prestige Series about them, with many superb photographs. Now, a question: EYMS destination blinds always had, in addition to "Bridlington-Lighthouse" and "Bridlington-North Landing" ("via Flamborough, Sewerby" in each case – a rare instance of the intermediate places being in the reverse order) a third provision "Bridlington-Thornwick Bay via Flamborough, Sewerby". No service to Thornwick Bay ever operated in my lifetime, and indeed the side road to Thornwick Bay was hardly up to bus operation and there was nowhere to turn a bus round when you got there. Did such a service ever operate before the war? Or was one planned but never materialised? "That’s all for now, folks" as the cartoon films used to say; oh, except for one thing – Mike: do you, or did you used to, live in Hessle? If so, I believe we met to exchange EYMS photographs etc. about 25 years ago. Re Boddys’ premises: you’re all more or less right, they had 3 covered depots, the little one in Hilderthorpe Road (more of a yard really, but with offices), the big one on the corner of Richmond Street and New Burlington Road, and a third in Horsforth Avenue (Anfields had the premises next door, by the way); also the coach park with kiosk on the Promenade (opposite York Road) and the booking office at the West Street/South Cliff Road corner. Chris ~ super idea for a gathering of all interested parties; do we all live in different areas, I wonder? (I’m in Middlesex.) Do they still hold the Hull – Brid. vintage bus rally? If so, how about us trying to meet up for that? Ken very interesting about Boddy and horse drawn carridges – he had 2 Austin Taxis I think. Patrick I have a correspondance file on things Bus 1970s onwards I’m sure I had a letter from a Mr Hooper was it yourself? Thanks for correcting Thorn Hotel not T Road. WF 7184- Thurgood C14F – right on all points however was the Clarke of N Frodingham a publican-Harold Hopper of Beeford had a photo of WF 7184 which he indicated he had owned then sold to Frankish, it had come from Thurgoods to him new, so it looks like Hopper-Clarke-Frankish-Burrell (or Burnell), YX Registrations-London CC 1928 Grey De Luxe thanks for this note. EYMS Blinds-I tend to agree no "service down to Thornwick Bay" however Archer Robinson ran small buses (probably the GMC Ks) off the road by the Thornwick Bay Hotel/pub to a refreshment building. Mike the info posted 17th is some of this from the Cards Mike Walker used to fill in for PSVC Mike and I updated cards as info came in. The Burrell brothers were Jobmasters off Promenade when Motors arrived they joined in – another vehicle they owned was a Durham-Churchill from Birmingham. J W Broumpton lived up St Johns St, the family name was spelt Brumpton and Brompton also! BT 2816 – ex Military Thornycroft. Stan Day and partner? Doris Day not the Brid ‘Stage Coach’ she had a 14 seat Fiat chara S/H from Harrrogate Road Car Co same source for WY 6254. BT 1948-Is this a taxi more detail welcome please. H Dixon-one of 3 Dixons Arthur Chas and Walter (problem here) there maybe a Flamboro’ Dixon family some did Haulage. Charles Dixon owned a Chara he may have driven for Mudford-A chara smash in Flamboro’ village late 1920s involved A D Dixon (driver for Chas) with a JB McMaster,(Hessle) Chara they collided with Dixon’s rear end, not known which Dixons branch. though Arthur Dixon had driven Horse Charas since age of 8 years!!! alledgedly. The BTs are correct is the PY 756 PY 754? Arthur Knaggs owned BT 382 it came from another Brid owner ended up in Nottingham I believe. Horace Howe Mudford I know of only this vehicle, he came from Sheffield. Ripley was Agent/Dealer, Two of these Vehicles given were Williamson at one time- AJ is ex Robinson Scarboro to Ripley. Re Boddy double deckers: I also have EN 4741 a TD1/Brush H24/24D from Bury Corporation, May 1948, but listed as scrapped in December, 1948, perhaps the body was in a caravan park somewhere? The Daimler CP6’s are listed in PB22 (Hull Corporation Fleet History) page 20, passing to Boddy in November, 1945, presumably without seats (they were used for reseating trolleybuses) again to a caravan park? Thanks Ian for the info on the Brid "operators" I knew you would be able to help, in answer to an earlier question about Kemps have some info on the following vehicles YG 83, GP 5147, VN 2817, VN 7273, EK 2068, WX 3567, WF 7023, WF 9299, YG 5084, BWF 198, BWX 663, AWY 218, DG 7409, EBT 172, AVY 187, GWY 428 & DUA 15. J Kemp, DG 7409, ANU 740. Most of this info will have come from the PSVC, therefore you should have the same. Please send us the pic of the Peoples BS in the United bus station if you get the time. Hello Patrick yes it was me, I thought I remembered the name from the distant passed, how are you OK I hope. Hi Ian, Keith Patrick and Chris. I cannot remember any of these buses at Skipsea, or at least not close to us within half a mile each way. This may help in elimination if you are trying to place them, Hull CPs etc. I do remember riding on Boddys Filey-Flamborough service, as I said ages ago. My memory was of a centre entrance bus, and it is re-crystallising (there’s a word!) in my memory so that it COULD have been in BCN livery, about 1947/8 time. Just a thought! Hi All, Following the recent comments on the small United bus Station in Bridlington, Here is the picture which shows a United bus (type Bristol ?? ), in the bus station. The photo is taken around 1960 or so and is extremely nostalgic, not just the buses, but the atmosphere; Pearsons novelty shop, a great delight for a 13 year-old. Hello Mike, following a recent post, are you the same Mike, that I purchased a large quantity of EYMS photos around 1979-80? I was living in Blenheim Street, off Prince’s Avenue, at that time. Oh Keith, what I would give to experience Bridlington again in those wonderful days. The evening of their fame was unfortunately looming for the "old order" of vehicles like the beautiful Leyland PD1, and yet the newer types like the United bus still had individuality and character. The Scarborough bound single decker is almost certainly one of the Bristol MW5Gs with ECW bodywork to the usual attractive and immaculate standard of the Lowestoft concern. These semi-integral vehicles, and their LS forbears with separate chassis, had a delightful but harmless little idiosyncrasy – it was occasionally necessary to open the cab gate slightly in order to move the gear lever far enough to the left to engage reverse gear – and I think its fair to say that the comment sums up the total of any adverse remarks that could be made about these tough and appealing and efficient machines. I admit to being biased with admiration, but I can think of absolutely nothing adverse to say about Leyland PD1s – the EYMS Beverley Bar masterpieces in particular. I believe that Pearsons novelty shop is still alive and well too !! In answer to Patrick’s suggestion about the Hull to Bridlington rally, yes the East Coast Annual Run is on Sunday 12th June this year. The possibility of a meeting at Bridlington of the Devotees of the golden independents is definitely worth some discussion I feel. I just had to comment on Keith`s wonderful photograph showing the Bridlington UNITED bus station! My overriding memory of the EYMS bus station is of an extremely cramped and tightly packed through "street type" bus station, and one where , once loaded, buses had to nudge through nervously to exit. I remember having to walk from the covered area to wherever the (Hornsea) EYMS bus might be parked, and this involved walking in close contact, and in front of parked vehicles, some with engines ticking over. I do not know when United opened their Brid bus station, but I have loads of memories of J and L type single deckers in this station , just over the road, and mostly showing "Scarborough". In this (later) case, the bus appears to be an MW type saloon. I wonder if the united/EYMS Scarborough service was in any way coordinated, or did they follow different routes? EYMS buses used to show intermediate points of Filey, Cayton Bay, and Butlins Camp. I don’t know why, but all this Bridlington nostalgia seems to be of a particularly powerful variety, and thanks, Keith for a super photograph! Hello all, I have a poor photo of Boddys YS 2093 Albion/Cowieson with Filey-Butlins camp on the blinds, which may be of interest (if any body has a better copy of this pic, could they post it) and a pic of FV 971 a still from the film "Holiday Camp" filmed at Butlins Filey. Yes Keith, I think that would have been me, I recognized a lot a the photos you sent to the EYMS web site, as supplied by me-I was hoping EY would put some of there own old pics on the web site! Hi All re film "Holiday Camp" was it a documentary or a comedy about the Huggits on Holiday the popular Radio family. I’m sure I have seen this years ago, lots of buses queue to drop patrons off at the ‘weeks’ end another queue of buses taking passengers back home definitely remember Albion Radiators (possibly Bullocks) some EY saloons too that Boddys pic is superb also never regret the poor quality pics they’re still a welcome sight till a better one turns up. It would be useful to find out if Holiday camp has been put onto DVD and which film company made it. I heard last week that the preserved Lion from Boynton Hall (Brid) has a new owner in the Keighley area the engine turned over within minutes of some TLC! false number WF 811. Mike re Kemp my info is not as complete as your notes indicate some of mine is from Giles bros fleet. Mr Walker and I lost touch when I moved across counties. The ‘Brid Meet’ in June sounds a good idea to me too, sorry I have not found the United pull-in photo yet still looking. I remember now been told that boddys ran double deck buses to and from various airfields been built in the 2nd world war and they were kept on airfields away from brid. Maybe this is how the first holiday homes arrived. I cannot remember the no of the Sheffield decker we got for its engine. maybe RWB or RWE I had the front no plate for many years but it is not impressed on my brain. Mike, yes some of the black & white photos on the EY website probably did come from you, please accept this as an acknowledgement! Re EYMS photos, I was lucky enough to see these in the mid 1970’s at Anlaby Road, but I did not have any means of copying them at the time; also I acquired a photocopy of the entire EYMS historical fleet list, and it was from this that the fleet details on the website was compiled, in addition to the one on this website. When I contacted Darren Stockdale at the EY website, he confirmed that the company had neither photographs or fleet list, perhaps they remained with the NBC residuary, somewhere?. With regard to the Lion "WF 811" I’m sure that I read that it had been running on it’s KW registration some time ago, I do have a photo of it at an East Coast Run from several years ago. I shall probably be attending this year’s ECR, but I don’t get too far these days, due to other responsibilities. Hello all— Keith, no problem with the photos on the EY web site, I would have sent them if you had not, many years ago, myself and a EY driver went to as many ex/old/deceased! EY staff that we could find, to try and get as many bus photos as possible, we did very well, and passed a lot of them on to EYMS and in return I copied many of EY’s collection (which I would love to go through again). The Holiday Camp DVD is still available and going for about £14 on Amazon not sure it is worth that, as it only gets interesting at the end when they are all going home on EYMS/United/Boddys vehicles. What a first class idea Ken – your stall sounds like a very convenient and easy place to meet and I, for one, am greatly looking forward to having a good chat with all the folks involved in this topic ……..ermmm book !! When I posted my little Anfields snapshot and the one of the WBS Gilford I never expected such a vast amount of expert archive material to surface – quite incredible, and very rewarding indeed. Just having a cursory look at this excellent site, I was interested to see Anfields Coaches mentioned. I was with West Yorkshire Road Car in the 1950s when Anfields had a ‘base’ in Malton in the charge of a Mr Lamb, and I got involved with them in certain ways, – at least one coach was based there – a Dennis I think, VD 6432. I believe they ran trips for the local York Football Supporters Club for a time out of Malton. David, that is a most interesting fact about Anfield’s connection with Malton. Mr. Lamb of Malton was, I believe, himself a coach proprietor and had a hiring arrangement with Wallace Arnold. Mr. Lamb bought (or hired from dealer Hughes) Sentinel UUB 931, formerly WA, in 1963 and used it for three years. I can confirm that Wilf Lamb did work for Anfields at Malton then set up his own business and on the boot lids of the Anfield Bedford SB3,s it said Bridlington and Malton. Wilf ran a centre entrance AEC ex Wallace Arnold for many years and if my memory is correct he had the Commer TS3 when Anfields closed down. Later Wilf also had a very nice Harrington AEC ex Flights. 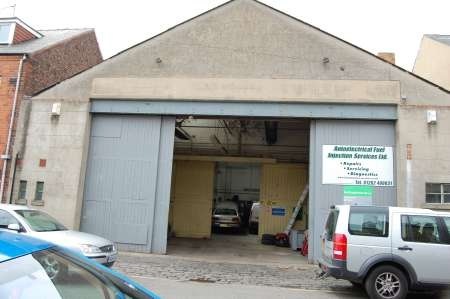 Here is a photo of the Archer Robinson/East Yorkshire premises which I took while in Bridlington a week last Tuesday. 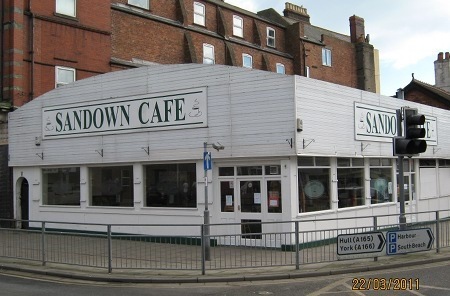 I’m sure that the present day customers of the Sandown Cafe can have absolutely no inkling of the automobile gems which have graced those hallowed walls in times gone by. Personally I would prefer the glorious whiff (and no cholesterol) of a reluctant misfiring PLSC Lion to the "chef’s special" of the present times any day. I know just the feeling Keith, and the same day that I took this picture I drove past the Boddy’s garage in Horsforth Avenue – its only thanks to this invaluable and enjoyable saga that I became aware of such premises. Next time in the resort, which could possibly be next Tuesday very briefly, I shall take a picture of that rather respectable looking building. While we are on Bridlington depots, can anybody tell me which depot this is?. This is in Havelock Place or Cresent not sure which it was used by Corrigans scrap metal merchants then frontage and house knocked down and then another srap man Brunton used it, now a carpet wharehouse. not sure who used it before EYMS, im sure someone will know! Ken, with respect are you sure this is Havelock Crescent as it seems a far more spacious premises than that narrow residential street would accommodate ?? Here is a picture I took a few years ago outside what was Williamson’s depot in Havelock Crescent – the elderly gentleman is one Harold Dowson who had been a driver with the Firm after WW2. This view is similar to the two which Mike Davies submitted recently. Hello Gents I’ve just caught up with the ‘brid busy bees’ comments, Havelock Cres is the scene with Mr Dowson about one third down the street from the Quay Road entry turn right down to the picture area. This was – I may have noted the GPO vehicle service depot rented from Williamsons. I believe it went through into Quay Road for the Wagonettes to exit into Quay Road remember no Queensgate as houses were demolished to create a road for it. Here is a picture of Cliff Street showing the length of Bus Queues in the summer season. The tall chap talking to the motorcyclists is Mr Amos Frankish a Driver note his drivers cap. The Bus is a second hand Maudslay the queue is at least 48 persons the Booking Advert states Flamborough Scarborough Hornsea there are six more trips-routes listed on other windows. Here is a ‘Map’ showing the street area,didn’t WBS have a small unit in Cambridge St down from Havelock St end between houses before Swindon Street end of Cambridge St? Hi All, just athought to throw into the melting pot! Didn’t EYMS purchase a propery in Havelock Crescent around 1929, prior to the "new" depot in St John’s Street which was opened in 1937? 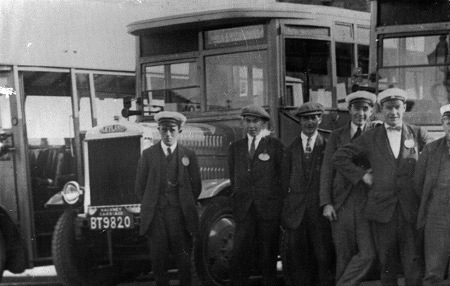 There wasn’t a great deal of services operated by EYMS in Brid’ prior to the purchase of Archer Robinson and Blue Bus companies in 1930. As Mike says, the Bookong Office sign does seem to be in the EYMS 30’s style, and I beleive that Williamson’s property never went into EYMS ownership at all, (neither did his buses for that matter)! Thanks to Ken and Ian for this further information on this really intriguing topic. I visited the location yesterday and took three pictures. The first two are, I’m sure, of the strange premises in Havelock Crescent – the ones in Mike Davies’ picture – so these buildings are still in existence and largely unaltered. A good view (over a wall) can be had from Queensgate and this suggests indeed that it goes back almost to Queensgate Square. The other view is taken looking into the corner of Havelock Crescent, and shows that this little building (which was securely locked) is now in the ownership of the Bosch car electrics agency who have Williamson’s premises shown in my picture. Incidentally I now appreciate for the very first time that the latter building is far larger and deeper than I’d previously realised, and was obviously capable of holding most if not all of Williamson’s fleet at any one time. I had a barmy moment in which I was sure that I could hear HD 4803 (ex Yorkshire Woollen Titan TD/Roe H24/24C) pursuing me up Havelock Crescent with asthmatic petrol engine – after I made a public fool of myself leaping out of the way onto the pavement I realised that it was only wishful thinking from a very very happy time long ago. The third picture is of the Boddy’s depot in Horsforth Avenue which in now, I’m told by a local, Council owned and houses amongst other things the pseudo "trains" which run along the Sea Front. 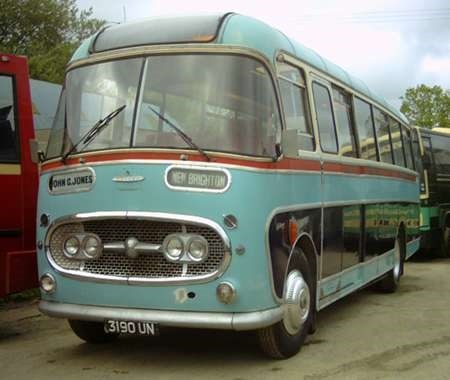 Wilf and Harold Lamb commenced coach operations in September 1959 with Commer Commando BJR325. The AEC Reliance was 8314U which they ran from12/68 to October 1973. (1) There was definitely no access from Williamsons’ garage (in Havelock Crescent) direct to Quay Road in my time, nor ever so far as I know – my father’s shop was at 250/252 Quay Road, located roughly where the non-existent exit is marked! (2) Nor am I aware of any "WBS unit" in Cambridge Street, which I cycled along on my way to Moorfields School. (3) The one-time EYMS premises in this vicinity were at the corner of Havelock Place and Havelock Street, with a rear access from Havelock Crescent. The building was a timber-merchants throughout my childhood, and I’m ashamed to say that I knew nothing of its bus history until long after I’d left Brid. Did you know that Williamsons had a small garage in Nelson Street? So now then, how many people are up for this suggested meeting-up on 12th June? It’s a 500-mile round trip for me, and probably a 2-night stopover, which I’m happy to undertake if worthwhile (wife may not be so happy but there you go) – what say you all? Hello all, Patrick thankyou for clearing up the direct entry bit into Quay Road this seems logical as I should have realised, Also the ‘imagined’ WBS premises in Cambridge St. I’m wondering if the Nelson Street place was made into a car parking area. Pre 1920 Williamsons Horse-buses would simply exit at either end of Havelock Cres as would the large Daimler deckers later on. Im happy to meet up 12th June as wife and I will stay over for a day or two on Pembroke Terrace near Spa then I can take some photos of Bus Premises on a ‘scenic’ drive of old Brid. The number of bus depots around Havelock Crescent seems to be increasing every week!! My notes show that EYMS purchased a garage in Havelock Crescent in May 1930 this was previously known as Dukes Garage, the depot was closed November 1937 and has been leased to many private business since July 1939. ( this fits in with the notes above from others) so is this the garage in the corner as pictured above? This depot was still owned by EYMS when it passed to NBC and became NBC owned. My notes also show that land in St John Street was purchased in 1936 and J Quibell and Sons Ltd, commenced building in May 1937, it was completed and brought into use 8th November 1937, it was extended in November 1952, and three cottages in front of the depot were purchased in 1956 and 1962 and an enlarged forecourt was developed in October 1962. I went to Brid last week and took the same photos of the same depot as Chris did, but I’m still not sure if its where I took the old black & white pic!! When I was 8 we used to play in an empty garage yard which I think was in Havalock Cres. There was an old coach in a big shed and we used to jack it up as high as poss with a huge trolley jack then take it in turns to drop it as quick as we could while others were sat in it! Health and safety? The ex-Sheffield PD2/12 that was stripped of its engine and various other bits and pieces in the summer of 1967 by Boddy’s at Bridlington was the former Sheffield 673 (RWB 73). The engine was transplanted into Boddy’s ex-West Riding Tiger, EHL 336, which survives in preservation, no doubt with the power plant from the erstwhile Sheffield machine still in place! I worked as a 15yr old in the West Street office of BODDY"S MOTORS. Flambro Lighthouse & North Landing 2/6d. Filey 3/-. Hornsea Potteries 3/9d. All the Scarbro shows of an evening & a Mystery drive 5 nights a week as well. My dad ran the office and coach park on promenade as well. Didn’t the West Street office become Aladdin’s Cave in the sixties? I remember the old Boddys coaches VBT191/192 and YXD12 from my childhood and probably travelled on them my father Bernard was a part time driver for them, he was a fire officer, the name at the top of this file Ken Wragg is familiar to me,I remember John Boddy and his son, also their operations Manager Bruce Gabbitas, I may have spelt his surname wrong! 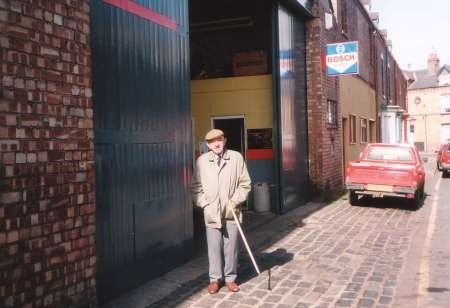 sadly my Father died a few years ago but it was nice to find these photos on the web, does anybody have any photos of Billy Richardsons garage in Quay Road or any of the old Priory Caravan factory behind Coggins Bakery in the Baylgate, I would be grateful if any were around. Hello all sorry to be taking over your site but as an ex Bridlington born person I can remember a lot of stuff being discussed and hope my comments clarify some points.in no particular order, John Boddys last taxi was a dark blue MK3 Ford Zephyr 4 he still had some taxi jobs despite his age, my Father did some jobs in this car for the company, I rode in it a few times. Despite his age John would not stop working, we arrived at the West street garage one evening to find John painting the garage doors, apparently the previous day he had to be stopped from climbing 20 feet or so up a ladder. 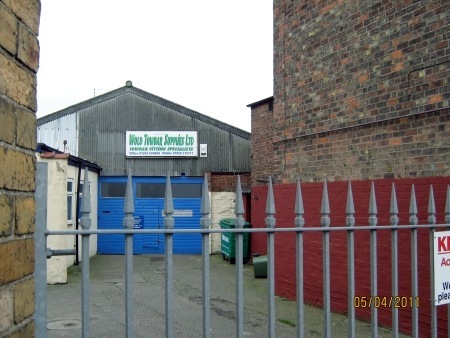 There was mention that Dukes had the garage in Havelock Cres, it may be correct but I do not recall it, there was a Dukes garage at the other end of the Cres in Havelock Street, they were not the same Dukes that had Buckrose Motors. Corrigans scrap yard was on the left in Havelock place, it did have an entrance in Havelock Cres. 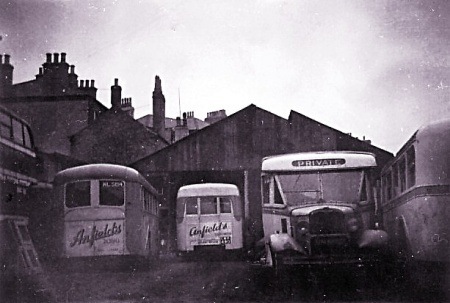 I remembered Anfields coaches and taxis, their premises were where Higgs and Barkers Vauxhall Dealership is now, when Fred Barker first took it over I am sure they used the old Anfields workshop. My Mother who is 80 and still lives in Bridlington remembers Mrs Anfield, she said she used to sit outside the taxi office (which they retained after selling the coach side to Boddys)chain smoking whilst holding a Pekingese dog, apparently she used to breed them. She also remembers Whites coaches, her comment was they ran the buses to Flamborough and that they were parked by the toilets in Queen St. I am not a huge coach and bus fan but a friend of mine is, he used to work for Alexanders the Coachbuilders in Edinburgh. I hope this information is useful to somebody. Thanks for those kind words Ken, my Mother has told me she has a photo of VBT 191 OR 192 outside the Park Lane Hotel in London that I will put on the site when it is found, I suspect my Father took it when he took some rugby fans to a cup final, did you go on one of those trips with him? Which coach hit the wall by the pond in Burton Agnes? I know who was driving it but I will not put it in print to save him any embarrassment but his initials were JG. I’m currently researching my grandad Thomas William Trown’s history of living in Bridlington and believe he may have worked for (Trown) Tooth, Waddington, any one with any more information please. Does anyone recall a bus driver by the name of William Isacc Morris Walker, who resided in Pinfold St., Bridlington. He was born in N. Ireland in 1914 and died in Bridlington in January 1998. Well chaps its almost time for our local Bridlington rally again its on Sunday 10 June and starts in East Park in Hull and ends up at Sewerby fields on the cliff top in Bridlington hope you can make it. Such an entertaining site especially due to the fact that much of this info refers to my Anfield relatives, my father being Jack Anfield died 1956 when I was 14. I am now living in the South and I would be delighted if anyone on this website has any memories and a photograph of my beloved late father. I am pleased to make contact through this site as it brings back memories to me of my childhood. Having acquired an old destination bus blind I thought I would do a little research to see if I could date the blind more accurately than 1950/60 and Google pointed me to your superb website. I have to say that I never expected passing a couple of hours contemplating the history of buses and their destination history. Captivating. My blind does seem to relate to a comment/question from Patrick Hooper: "No service to Thornwick Bay ever operated in my lifetime, and indeed the side road to Thornwick Bay was hardly up to bus operation and there was nowhere to turn a bus round when you got there. Did such a service ever operate before the war? Or was one planned but never materialised? " My blind has the header "HULL WITHERNSEA EXPRESS" and contains all of Patrick’s mentioned destination plus many more; all of them are of a personal interest as childhood memories,: BEEFORD, ULROME, SKIPSEA, HORNSEA ot mention a few. The Header also contains the following information: Buses 508. 519. Manufacturers Whitlay Tool Co. Bin 3965 HOLLYM. Town Center-Waxholme Rd. Whitlay as a company were dissolved in 1968. Another pointer to dating might be the Destination HULL HEDON Via Marfleet Saltend Aerodrome Entrance, as I understand the Aerodrome became a speedway circuit in the late forties early 50s but only lasted a year or so however the destination, Aerodrome Entrance could have carried on for years. I could put up photos of the blind if required. Just wondered if an answer to Patrick’s query helped with my dating. Either way it’s all become an interesting and nostalgic journey, including your site. The Thornwick Bay Service was originated by Archer Robinson in the early 1920’s as a branch off his Bridlington-Flamborough service. He owned the cafe at Thornwick Bay. His business passed to East Yorkshire Motor Services in September 1929-presumably they continued the service as long as it remained profitable. Hedon Speedway was operating from March 1948 to August 1949. I don’t think that there would have been any reason to have the Aerodrome Entrance on a destination blind after 1949. Such happy days – oh, and the ECW rebodied Leyland TDs which provided Saturday night duplicates from Hull depot, with identical displays……….. The EYMS timetable for Summer 1948 lists Thornwick Bay in its alphabetical list of places served and the map actually shows Thornwick Bay as one of three legs after Flamborough (Lighthouse, North Landing and Thornwick Bay). The service was no. 28 (which, of course, was not displayed on the blinds)and the timetable quotes Ye Olde Thornwick Hotel some two minutes after leaving Flamborough and three minutes before arriving at North Landing. Buses to the Lighthouse did not call there. The frequency was roughly hourly, the last journey from Bridlington being at 10 30 p.m.. The Winter 1950/1 timetable has the same service but the map omits Thornwick Bay. Sometime in the 1950s references to Thornwick Bay disappeared. The 1940 timetable also contains references to Thornwick bay but the service was very restricted owing to wartime conditions. A Bridlington book would be a great asset. My family holidayed at Sewerby and Barmston in the 1950s and I have many memories of EYMS and the White Bus Company. I am Gt Gt Granddaughter of John Williamson who founded the Bridlington Bus company. He and his family were all involved in different aspects of the business. Horse dealing and beach donkeys was the work of my Gt Grandfather Thomas, but his older brother Robert and youngest brother Reuben worked on the buses as bus/carriage drivers. Another brother Reed had a livery stable on Market Place and was a horse breaker. John Knaggs worked for Reuben Williamson and Reuben was summoned under the Elementary Schools Act for employing John Knaggs before the end of term. My father said the horses used to launch the life-boat. Not only were John’s sons involved in the business but also grandsons too. My Grandfather in 1909 is identified on his marriage certificate as a carriage driver. He married into the Pant family. John Wm Pant was a cartman in the town as was his uncle and grandfather. The Bridlington Free Press describes John as a popular man who started working life as a mariner plying the Baltic. He was involved in the Crimean War and the Battle of Sebastopol where he was taken a prisoner. Whilst in Russia he learnt to speak some Russian despite the fact that the conditions were desperate. On returning home he set up as a shoe-dealer. Around 1881 he set up his son Robert as a bus proprietor. Read with interest the comments on old coaches my father John drove for EYMS for 39yrs and drove the first London Birmingham service from Brid two new Leyland Tigers or Leopards in yellow PAT 1 and PAT 2 registration I can still remember at 70 my dad getting ready to go with his small brown overnight case and saying I hope I have PAT 1 because it was 6 miles an hour faster than PAT 2 on the A1 I wonder what happened to them. 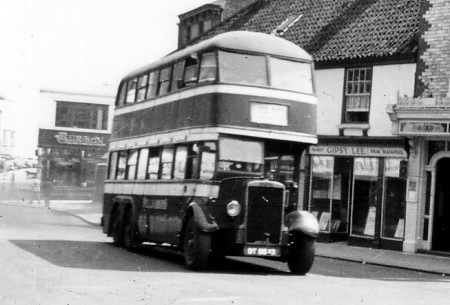 To clear things up about Trown, Tooth & Waddington in Bridlington, the partnership first operated buses on two services in the town in January 1922 Belvedere to the Market Place and a Circular service from the Promenade. The trading name was variously ‘Bridlington & District Motor Services’ and ‘The Red Bus Service’ further services were added to Flamborough (5/22), Driffield (6/22) & Bempton (3/23) the depot was located at Alexandra Garage on the Promenade which was also the home of the business of motor engineers which they ran. 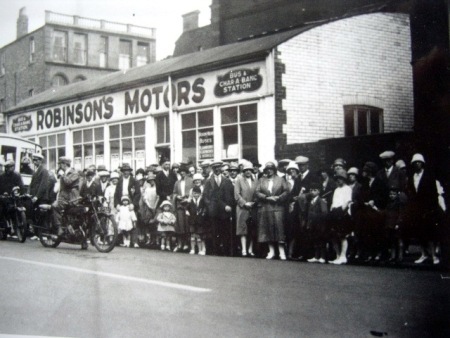 In December 1923 Tooth & Waddington (Motor Services) Ltd was formed to take over bus operations of the partnership. The fleet at the end of 1922 was 7 AECs (2x42st dd, 1x46st dd & 4 30 seat saloons), no registrations except a dd BT 5288. In January 1925 the operations of the company and its vehicles were acquired by Archor Robinson. Two toastracks were owned by Robinson by 5/25 so these were presumably the two Leylands BT 7268/9 that were new to T&W in May 1924. In the early 50s my brother and I played in Anfields yard Bridlington, we jacked up the coaches and let them down with a bang whilst friends sat inside. Great fun! Even though this is not my subject, this site is so interesting. I was born in Bridlington in 1948 and all I can add to this site is a child’s memory of Anfield’s garage. I spent many a happy hour in the early 50’s secretly playing in these buses, covered in oil and grease much to the dismay of my mother. It is quite correct that the business was located on a corner of Quay Road; I recall there was a gas company showroom on the opposite corner just before the level crossings. The picture of the front of the business onto Quay Road was adjoined by three or four terrace houses of greater antiquity than any in the neighbourhood, abandoned with all their contents still inside. I gathered that they were evacuated and never refurbished after they were damaged in an air raid on the nearby gas works in WW2. The road between did indeed lead to the back entrance to Moorfield’s School. 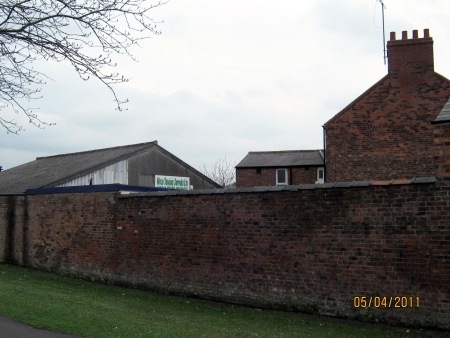 The picture of the yard at the back of the office does not show many buses but, in my time, probably a couple of years later it was full of old buses right up to the yard entrance in Moorfield Road and were already old even by the standards of my time. I also recall an old London style taxi cab parked there that still had a working bulb horn that must place it in the 1920’s or earlier. I look forward to reading any new additions to this site.